As always you can click my pictures to see them larger! Last month I was browsing through the Timeless Trends website, when it occurred to me that "hey, maybe I should try one of their overbust corsets". 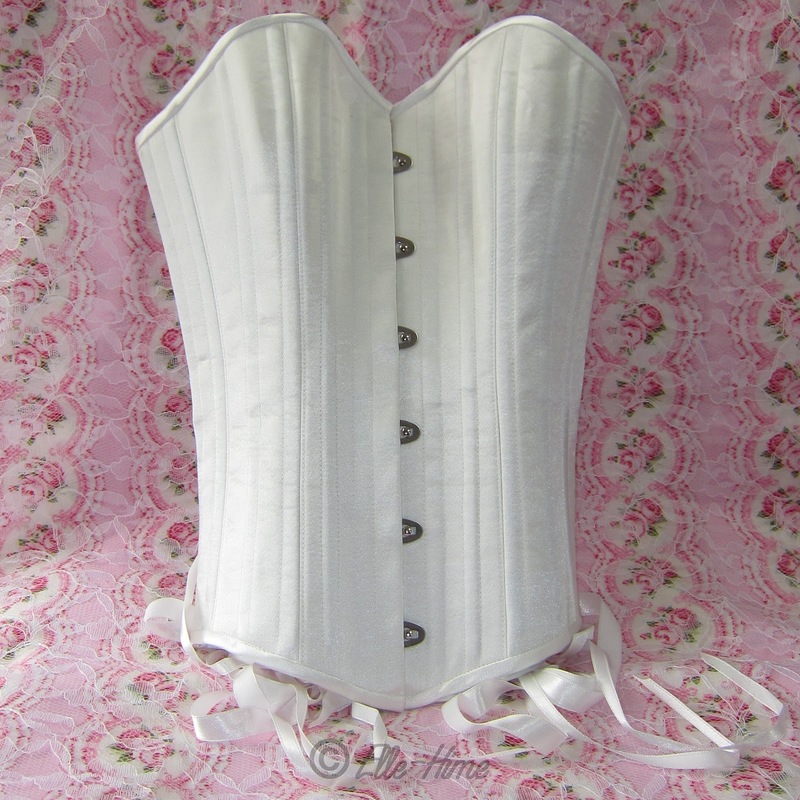 I already own one of their underbusts and it is a great corset for the price. I contacted their customer service (which is very helpful), and confirmed that I was going to be trying the correct size. I placed my order and had the corset a few days later. Here is my review of this off-the-rack corset! The size I purchased was 20S. All corsets will have a bit of leeway in what body shapes and sizes they can fit, and you should refer to the helpful guide on Timeless Trend's website here to find your size. The 20S overbust corset that I'm reviewing has a 12-inch busk, fits a natural waist of 25-24", and is intended for A and B cup sizes. Timeless Trends corsets are made of top-notch materials. They have real spiral-steel stays that are super durable and comfortable to wear, and the busks (front closure) are very sturdy as well. There is waist tape sewn in to help reinforce the waist. The outer fashion fabric (in this case satin) is laminated to the inner fabric, and then the whole corset is lined with soft, sturdy cotton. 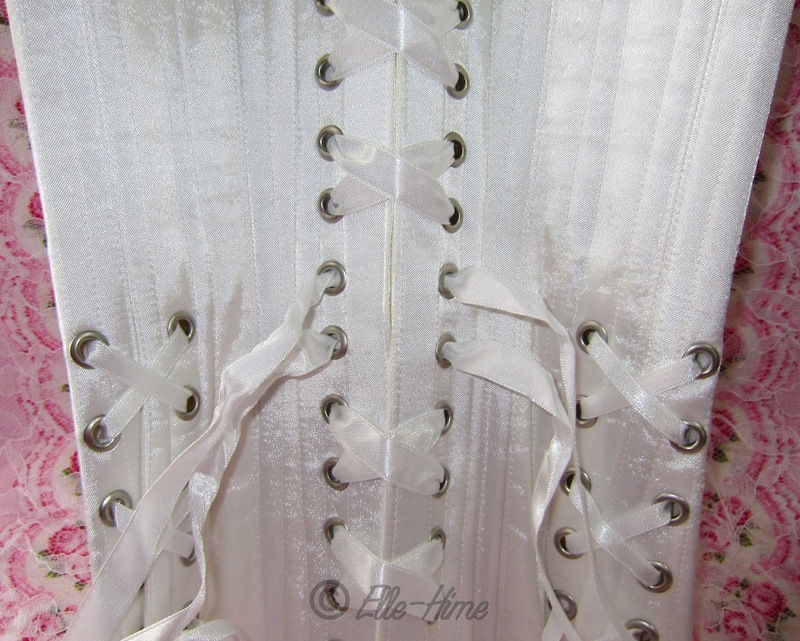 The laces can vary depending on what corset you get but the ones I have had used ribbons - these are easy to lace and tie and have been durable. The overbust model is longer than their underbust in both directions, so they have additional lacing to adjust the hips. 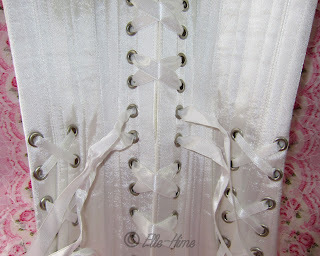 Here are two pictures of the back of the corset when it is laced shut, which is how you receive it. And here I moved the panel away from the laces. You can see that it is sewn on just one side. Its purpose is to cover the gap in the back when you are wearing your corset. Corsets aren't supposed to be laced shut on people - a gap in the back allows for your spine to be comfortable. So, the modesty panel covers your skin, and also protects it from any chafing that might be caused by the laces. Personally I wear a thin cotton corset liner in my underbust for the sake of keeping the corset clean. The ribbons on these Timeless Trends corsets have never hurt my back. One thing I did experience with the modesty panel in place is that the ribbons did not pull as smoothly; lacing in took a little longer. However, it also had the side benefit of the ribbons staying put when I tugged them. It was much easier to get a secure bow tied behind my back! 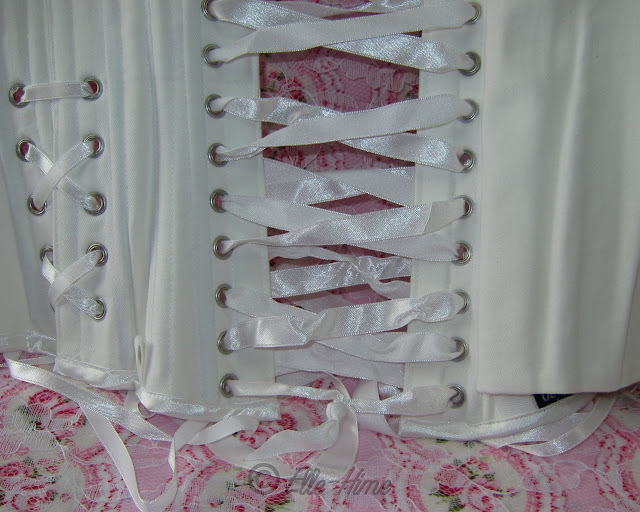 Here is one more picture; the lower inside edge of the corset. You can see where the modesty panel is sewn in, then one of the grosgrain ribbon garter loops (next to the black size tag), the small 20S ribbon tag and the Timeless Trends brand tag - none of which are a bother, and then the adjustable hip lacing area. Because I am of small stature (not quite 5'3"...) the size 20 underbust corset will start to cut into one spot on my hipbone when laced tightly, and I went for the overbust in hopes that the extra length and room for hip adjustment would fix that problem. It does and it doesn't. I never had and rubbing or pinching in the fit of this corset, but I did find that the grommets and ribbons over my hips were a little bothersome. I would definitely suggest having something to wear under them. A mini hip modesty panel would have been a superb addition. I will say that for being a few inches longer than my underbust it wasn't a huge difference in how much skin was being covered. These corsets come up fairly high on your back in either style that you want, so depending on the plunge of a neckline in the rear they may not work for all outfits. For me they both came up to "bra strap level" in the back, which I am totally okay with. In the front I had the same coverage as the usual balconette-cut bra. Overall it gives a very supportive fit. Disclaimer: The corset featured in this review was purchased, and returned, by me. I had offered to do a review and so I have. All these words are 100% my own and my honest opinion. Yes! Another Timeless Trends fan. I love their corsets, they're really good for mixing with casual clothing, too. Yes, they are. The shape they give is beautiful and natural. It really was stunning! I marveled at it while unpacking. Definitely all the quality of a custom-made steel boned corset, only off-the-rack instead! Okay. I am literally in LOVE with this corset! So beautiful and sophisticated! So my question is,does the corsets really help to minimize your stomach and waistline?